Across the globe, on avearge, people spend more than 420 minutes consuming media per day, according to a new study by ZenithOptimedia. The report split up media into several categories. The internet category includes streaming television and movies. The other categories refer to traditional formats like print media and broadcast television. Internet usage has been growing rapidly since 2010. 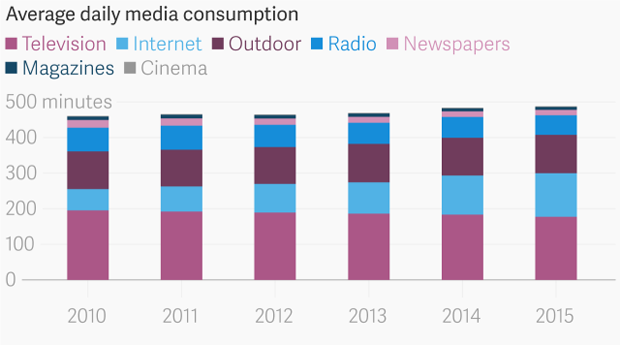 The change in average daily consumption of internet increased by 105% since 2010, while every other type of media (except for outdoor, which accounts for a 3% increase) declined.